Discussions were framed in this sense of urgency, with numerous panelists reminding the audience that it is the world’s youth who bear the long-lasting human, social, and economics costs of conflict. The forum included three panel discussions highlighting diverse approaches to youth-led peacebuilding, strengthening resilience to violent extremism, and diverse trends for the future of peacebuilding, including the future journey of UN Security Council Resolution 2250, ideas for re-branding “peace” to engage youth, the pressing threats of climate change to security, and the cost-effectiveness of peacebuilding. Speakers at the Generations For Peace-UN Forum on Youth-Led Peacebuilding. Jordanian ‘Musical Ambassadress’, Farah Siraj, opened the first panel discussion with an original virtuoso performance of two very moving songs. Her lyrics spoke of the pain of women in conflict affected states and assured these refugees neither they nor their children’s rights are forgotten. Speakers from Search For Common Ground (SFCG), Mercy Corps, Peace Direct, Aware Girls, Cure Violence, and Peace First, shared their different approaches to youth-led peacebuilding and conflict transformation regarding engagement, access, diverse contexts and overcoming barriers in the field. Michael Jobbins, Director of Global Affairs from SFCG, emphasised the need to create and support positive role models for youth in systems of injustice. “Fundamentally we live in a world that is outrageously unjust. Young people are the last to accept injustice and nowhere is life more unjust than for children growing up in Congo, in South Sudan, in Yemen… But how they [take action] depends on what are the options, and what are the role models that they see.” Jobbins shared SFCG’s conviction that youth have the frustration, the will, and the capacity to be impactful, but that it is the role of peace-building NGOs to provide them a positive pathway to overcome the generational crisis of injustice. SFCG’s approach seeks to confront issues in communities where people of differing cultural, religious, ethnic, or racial backgrounds lack understanding of one another despite increasing mass media exposure. “With the explosion of connection and connectivity, there hasn’t necessarily been an explosion of connection in the empathetic sense the word. People are in contact more and more with people who are different from them…but they’re no better equipped to engage with them,” Jobbins said. Generations For Peace volunteers in South Sudan aim to address existing inter-tribal conflict and improve the relationship among and between youth from the Dinka and Nuer tribes in Juba. Karen Scriven, Senior Director for Strategic Fellowships at Mercy Corps, also shared the view of youth as agents of change. Scriven described her organisation’s reliance on a systems approach to best understand the conflict dynamics in society. The latter aims to highlight the range of factors influencing conflict dynamics in a society by addressing each as a component of a complex whole. Using this approach, Mercy Corp has been able to identify that conflicts often occur as a result of a disruption in the governmental, ecological, or social systems. Scriven also shared recent innovative work by Mercy Corps in testing measurements of cortisol as an indicator of stress levels as pre- and post- data collection for youth participating in activities designed to support post-trauma rehabilitation and restoration of self-esteem and self-efficacy. Saba Ismail, founder of Aware Girls, a partner organization of Peace Direct, shared the similar work the organisation’s project Youth Peace Network is conducting in collaboration with teenage girls to prevent local youth from being recruited by militant groups in the Swat Valley in Ismail’s home country of Pakistan. “[We are] strengthening the social fabric harmed by the extremist groups by bringing people of different cultures, different faiths, and different ethnicities together through intercultural and interfaith dialogues from which they understand each other,” Ismail said. These dialogues are carried out over the course of three to four months in faith centres, churches, mosques, Hindu temples, and Sikh Gurdwara, and connect communities through music, art and poetry. Fifteen years ago, Epidemiology Professor, Gary Slutkin, from the University of Illinois at Chicago launched the Cure Violence Programme based on the understanding that violence is a learned behaviour which can be spread, and that its transmission can be treated in similar ways to a public health disease prevention approach. Since then, according to Caliana Thomas, Coordinator of Technical Assistance and Community Engagement for the New York City Cure Violence Programmes, the public health approach to peacebuilding has reached 25 cities across the U.S. and many sites internationally including Iraq, Syria, South Africa, Kenya, and Nigeria. The innovative approach to mitigating violence as a public health concern has proved effective. In New York, Thomas said, Cure Violence operates in 18 sites in all five boroughs, neighbourhoods which once accounted for 50% of all gun violence in New York City. Cure Violence recruits community elders to share their lived experience with youth, delivering messages related to gang violence and illegal activities. “These people have come back to these communities and have used their experiences to work with youth and make a positive impact, they are respected, streetwise and connected and able to relate to youth. Based on their knowledge of community dynamics and similar lived experiences, they are able to identify and teach the highest risk youth, those likely to perpetrate or be victims of violence,” Thomas said. In the second session, panelists addressed the key differences between the strategy of Countering Violent Extremism (CVE) and Preventing Violent Extremism (PVE) and discussed how to strengthen resilience to radicalisation. Dr. Mohanned Arabiat, President of GFP, explained the two strategies from GFP’s perspective, describing CVE’s connection to counterterrorism and security, whilst PVE, which resonates much more strongly with GFP’s conflict prevention work, aims to support communities to help prevent youth from becoming vulnerable to radicalisation. GFP volunteers attend a Training in Tunisia. The programme aims to strengthen youth resilience to violent extremism in Tunisia through positive Sport and Arts For Peace activities. Dr. Arabiat discussed the importance of taking a holistic approach to counter the narratives of violent extremist groups – identified by the Quilliam Foundation as brutality, mercy, victimhood, war, belonging, and utopianism – with a message of resilience and hope. “Extremist organisations have been effective in tapping into deeply ingrained ideological values and in exploiting grievances as a means of successfully engaging susceptible and vulnerable audiences.” He reiterated the importance of peacebuilding at a local level as a method to counter the global phenomenon of extremism, starting by trying to understand how communities interact in order to develop better solutions. Dr. Arabiat also spoke of the importance of developing stories of hope to make known the work of peacebuilders on the ground, a mission reiterated by Mazen Hayek from GFP’s partner organisation, MBC group. “We have developed an adaptation and fatigue to bad news. So, numbers of millions of refugees don’t move people anymore. Pictures and footage of torn apart bodies or wreckage or people under the soil don’t move people anymore. And this is hard to deal with from a communication and from an image perspective,” Hayek said, adding that leaders in media have a responsibility to produce role models for youth in order to fill the vacuum in society currently occupied by terrorist networks. Rather than covering the aftermath of attacks carried out by extremist groups, Hayek argued for a proactive approach from both regional, and global, media networks. If they fail to take this collaborative approach to counterterrorism, then they are, “leaving the ground for [extremist groups] to communicate and to win hearts and minds,” Hayek said. The third and final session highlighted diverse trends for the future of peacebuilding, including the future journey of UN Security Council Resolution 2250, ideas for re-branding “peace” to engage youth, the pressing threats of climate change to security, and the cost-effectiveness of peacebuilding. Cécile Mazzacurati, Head of UNFPA’s Secretariat for the Progress Study on Youth, Peace and Security highlighted the relative infancy of UN Security Council Resolution 2250 (especially by comparison with UN Security Council Resolution 1325 on women’s participation in peacebuilding) and the fresh momentum given to the resolution by the announcement this morning of the “Champions of Youth Group” of 22 Member States reaffirming their support to it. Mazzacurati emphasised the need to continue to engage diverse partners, and to maintain the rich complexity and depth of the 2250 agenda. Mazzacurati also highlighted that “innovation is coming from civil society and pushing the UN to be better” and to be willing to adopt new strategies for peacebuilding, with specific and sustainable community goals, rather than continuing to rely on “old recipes” that fail to produce results. However, Mazzacurati identified a challenge in supporting youth organisations who may lack basic administrative capacity to meet donor requirements, and the continued importance of intersectionality of the youth and gender agendas and the need to maintain a strong focus on the role of young women as ambassadors for peace, keeping in mind the common gender discrimination they face when trying to adopt this role. Hiba Antoun (far right) began her volunteer career at age 12, later joining GFP in Lebanon in 2012. Her leadership in cross-cultural engagements demonstrates the importance of empowering youth with the skills to be the driving force behind peace-building goals. Julia Roig, President of Partners Global and a representative of Alliance for Peacebuilding, presented the need for positive narratives by relating them to an ecosystem. “We have extensive networks of wonderful young people all over the world but we still are a drop in the bucket of the narrative landscape and the media landscape,” Roig said. “We know that today’s youth are marinating in narratives online, through the media that they consume, the music they listen to. So how do we up our game as a field?” Roig proposed peace-building leaders collaborate in a “Narratives For Peace” platform to develop a collective storytelling engine, by creating a sophisticated network with media advertisers and creative industry leaders. Faced with the competitive noise in media communications, Roig emphasised the problem that our focus and love for local diversity and complexity “is really bad messaging…: our movement and our allies are dispersed, so how can we possibly break through the noise; because people on the other side are very targeted, they’re very focused. …We need to de-complexify, and at least have a uniting narrative frame to use the power of our collective voices”. Mariam Farag, Group Head of Corporate Social Responsibility for MBC Group, reiterated the message shared earlier by her colleague Mazen Hayek that media conglomerates, like MBC, hold a responsibility in the region to promote peacebuilding. She shared MBC’s various strategies for rebranding, a decision made five years ago to humanise the organisation by taking the work from “on screen” to “on the ground”. MBC Hope’s initiatives for empowerment of Arab youth range from supporting startups to child protection and education, goals which led them to partner with GFP. MBC continues to remain rooted in their role as a media leader, using narratives and film to make a social impact. “We actually support young directors and producers in the region to start creating films, short films, that focus and that address social impact issues and causes within the region. Issues like early marriages, a topic the region has been ignoring for years, women empowerment, street children.” MBC’s recent launch of “Shabab 2030” (“Youth 2030”) also presents an excellent example of a media campaign to promote awareness of Agenda 2030 and the Sustainable Development Goals. 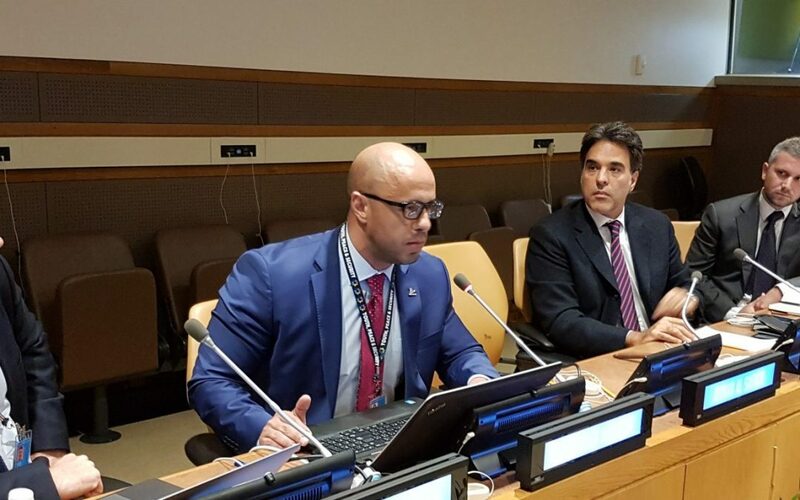 Founder and Global Coordinator of SDSN youth, Sam Loni, said that while UNSCR 2250 was a groundbreaking step that recognised youth as key stakeholders in peacebuilding and prevention of violent conflict, it failed to recognise the dire risks to youth, peace and security created by climate change. “Climate change has traditionally been viewed in isolation from matters of security and human rights. However, our thematic papers show that there is a nexus between climate change and peoples security becoming ever more clear…The rapid changes in the climate coupled with instability is likely to threaten the lifeline of many groups living in fragile societies, ultimately leading to additional tensions and leading to violent confrontations.” Though governments invest billions of dollars in development, Loni warns that policy makers risk reversing decades of progress if they fail to recognise security tensions related to climate vulnerability and emphasises the need to bring youth to the table to engage in the conversation. Daniel Hyslop, Research Director for the Institute for Economics and Peace, discussed how best to reverse negative trends over the last ten years, in the face of increasing conflicts and growing refugee populations. According to the Institute’s March 2017 report on “Measuring Peacebuilding Cost Effectiveness”, 23% of 15-29 year olds lived in a state or province with armed conflict in 2016, with many increasingly involving non-state actors. This increase in violent extremism is disproportionately affecting young people. Every $1 spent on conflict prevention saves approximately $16 on the costs of violence, and yet, 12.6% of global GDP is spent on costs of violence, compared about 1% of global GFP on peacebuilding and peacekeeping combined. The Nashatati programme aims at providing children opportunities to interact and engage through fun after-school activities that foster life skills development, active lifestyle, tolerance, acceptance and social cohesion within communities. Lakshitha Saji Prelis, Director for the Children & Youth Programmes at Search for Common Ground (SFCG), summarized the challenges faced by forum participants trying to implement UNSCR 2250 since it was adopted in 2015, stressing the need for an open forum for peace-building leaders to collaboratively engage with one another and share their proposals and strategies for peacebuilding; and highlighting that: “People have lost faith and trust in institutions, whether it’s the media, the governments, international NGOs; it’s our failure. Issues are more complex,… our crumbling infrastructure needs to be empowered in a way that enables these efforts to be addressed better.” Prelis concluded that this could only be accomplished through authentic collaboration, and the Working Group on Youth Peace and Security has produced a useful framework for action that can guide action and collaboration by all Forum participants. The intention is to host a similar forum in 2018, but outside the constraints UN General Assembly Week, to allow more creative interactions and presentations, and allow much greater participation of youth voices in the room.